Grow Your Beauty Business - Get Great Tips for How to Succeed! You’ve worked hard to grow your beauty business, from the day you went to your bank for a small business loan until the day you opened your shop. And then, dedicated and committed, you’re open for business. Let’s take a look at some beauty salon tips that can help you. For example, a beauty salon in a small community can try social media like Facebook but sponsoring an annual, communal event might be more effective. By showing you care, you can bring people closer, faster. A salon in a central business area offering services to lunch break foot-traffic might do things differently. An initial discount or sponsored Facebook ad campaign would work well. Be reachable: You might want to consider using a bookings and cancellation program, like Salon Target. Some clients may not want to speak to a person to book appointments. Others don’t want you leaving their side while you answer a phone. Consider punch cards for loyal customers: You can require these to be tied to a specific client, which means you can collect emails and phone numbers for marketing purposes. Client perks could include fifth visit discounts or free entry to special beauty events. Social media: Give out tips on Facebook beauty groups or get your Instagram groove on. If you look like the expert to clients, you become one. Customers are always looking for beauty tips, and if you don’t provide, someone else will. Be aware that doesn’t affect face-to-face client time; you can do it if a customer is running late, or in the evenings, for instance. Therapeutic marketing. A good hair wash can make your client’s day, but they won’t always know what they want. Your options, explained with patience, and joint happy decisions keep clients coming back. There’s no substitute for trust and listening therapy. 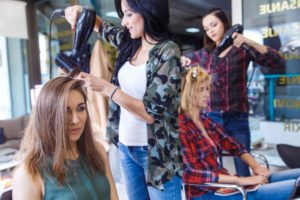 Whether on social media or at the salon, your style is your brand and this applies to staff too, so when interviewing, look for personable, reliable staff that share your beauty philosophy and want to help you grow your beauty business. Interactive interview: Ask your interviewee how they feel about upselling. Can they naturally book a next appointment or recommend a product? Think about adding a short role-play to your interview as well as a demo. Flexibility and loyalty: Offering late night appointments for busy clients can work well for both employee and employer, as long as everyone agrees in advance. It can be a way of gaining staff loyalty, offering flexibility and ultimately, growing your business, but you’ll want to make sure this will work for whoever you’re hiring. Training days and team bonding experiences are good ideas and ensure you’re all on the same page. That leads us right into a common question: when is the best time to expand your business and take on more staff? You need to find the right time to hire or grow, strategically. The time to grow is when you can rely on the area you’re in to keep providing, i.e., there’s room for expansion. You know there’s money coming in and your customers are regular enough that you can listen to their needs and provide more. Sometimes, it’s about variety in a competitive market. Even a luxury brand like Sephora felt the need to diversify, using beauty tech tools to be heard over the noise. First things first, it’s worth meeting with an accountant with beauty industry experience from the outset. Keep them posted and have a discussion about your desire to grow. Practicalities: You might have to recalculate a budget, amend your beauty salon business plan or upgrade your beauty insurance to higher limits for a larger business. This ensures smooth business growth. You’ll also gain the confidence that you can manage if the unexpected happens. Raising prices. As part of your expansion, you might want to raise prices. Although this can be scary, you need to value the service you provide and understand your worth. Remember our marketing point above: Who will gladly pay for your service? Mindset. Don’t see the cash in the register as yours until you’ve seen your monthly figures. Be product and equipment savvy; not all are worth the high price tag. Beauty salon business expertise is something you will acquire with time. That’s ok, entrepreneurs learn from doing and you’re likely to get even better with time! General Liability vs. Professional Liability: What’s the Difference? Does a Waiver of Liability Guarantee Legal Protection? What is General Liability Insurance? Do I Need It?